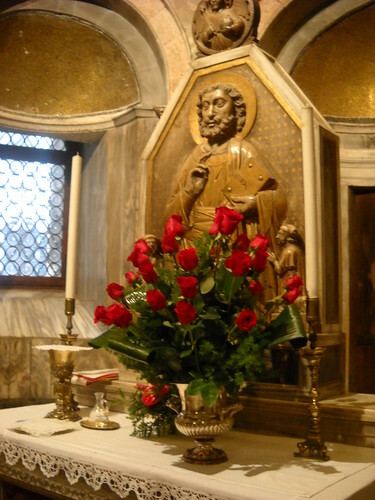 Yesterday twenty-one red roses, twenty-one ‘rosebuds’, were offered to the altar of the Nicopeia Madonna in St. Mark’s Basilica at the end of the mass held by the Patriarch, Cardinal Angelo Scola. A special gesture to remember the martyrdom of the Christians in the world and the massacre of 21 people which has hit the Coptic community of Alexandria in Egypt, a church that is particularly close to that of Venice, since both were born from the preaching of Mark the Evangelist. Cardinal Scola, in an interview with the Corriere the imam El Tayeb, head of the al-Azhar mosque, asked the Pope for a sign in order to re-establish trust. You have been involved in the presence of the Christians in the Middle East for decades now through the Oasis Foundation. What do you think of El Tayeb’s words? “First of all we must bear in mind that we still know little about each other. This is shown by the fact that no practising Christian would recognise himself in the image of his faith which is current among Muslims and vice versa. There is also an urgent need to face the big problem of the relationship between truth and freedom. It is a question of a balance that must always be regained, since without truth man loses his way, but without freedom man is a slave. Violence is born from this too”. But the Christians have never threatened anyone, but are rather the victims of those who in the name of religion carry out massacres and spread fear and death. “Unfortunately perceptions are radically different between one side and the another of the Mediterranean. In the West many feel under attack from Islam, while in the East many consider that it is Islam that is being attacked. The media are responsible for this too. However, we must keep to the facts: it is not the first time that terrorists, claiming to act in the name of Islam, have carried out abominable suicide attacks in a church where a group of Christian faithful had gathered to pray”. Benedict XVI has asked for protection for all Christians. How do you explain that this position has been labelled as interference? “The Pope is not asking for any special treatment for Christians. He asks for the respect of the fundamental rights of every man, among which there is obviously the right to live, to publicly profess a religion and to not be driven out of one’s own country. As in the attacks in Alexandria, like in Baghdad in October and Nag Hammadi a year ago, in Pakistan very frequently and in India or in China, it is the Christians that are hit, the Pope, who bears the responsibility of over one billion faithful, considered it his duty to call the world’s attention to the problem of the persecution of the Christians”. “Europe must act in a more clear-cut way for the respect of fundamental rights, and have the courage to not subordinate them to economic interests. Moreover, Europe can promote, through facts, a model of plural society in which the different members recognise each other starting with the practical good of being together. This is an idea on which the lay and the believers of the various religions can find a meeting point. An idea which, in the medium term, can be a paradigm for all countries”. The Islamic kamikaze terrorists consider themselves martyrs. For Christians too, martyrs are called upon to bear witness to Christ in the highest and most definitive way. What difference is there? “The difference between a martyr and a suicide terrorist is radical. In his offering the first embraces his own persecutor beforehand. His prior forgiveness thus wins over an unjustifiable evil. The suicide terrorist prepares to die, but his gesture is aimed at the destruction of others. For this reason it is intrinsically an evil, a negation of the human”. In the past centuries Christians and Jews were forced to live like ‘dhimmi’, subjugated, under Islam. Is this inevitable? “Absolutely not. The words of the imam El Tayeb in the interview that you mention were quite clear. And to tell the truth, the imam had already expressed his position also in other circumstances, for example in an interview to the Lebanese newspaper an-Nahar some months ago. I was able to read a preview of it prepared for the next Oasis newsletter. In the Muslim world a battle of ideas is going on, next to that of arms which everyone can see: anyone who thinks that nothing is moving would be wrong”.